Black 19" x 11-1/16" MCS Sports Team Photo Frame with clear glass front to display your favorite 5x7 and 8x10 team photos. Go Team! 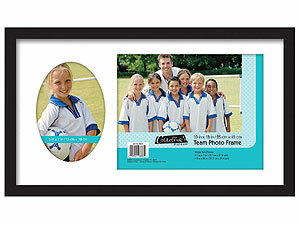 This MCS 8x10 Sports Team Picture Frame allows you to display your favorite sports team photos. Our team frame is great for any sport, including soccer, football, baseball, basketball, hockey and more.